Print on plexiglass. The reality is seen from a particular point of view, reflected in the rearview mirror of the car that becomes the "slow", the pause in the hectic traffic that we live in everyday life. The mirror is like a screen, is the container of short memory, that frenzy making us lose. Rudy Falomi was born in Milan in 1964 and graduated in Visual Communications, Cinema, Television, Graphics and Photography at the ITSOS in Milan. Trough XNUMX years living in the printing field, where he mainly worked in the art, theatre and live music area, the passion for photography never left him. His photography denounces the epic particular moment we are living now, not anymore partitioned by time, but by the speed we apply on it. From these reflections has birth the project that sees reality from a particular point of view: reflected in wing-mirror of the car: ''One day, driving, I have noticed the Arco della Pace, seen from the wing-mirror of my car, was more suggestive. Forty seconds before I had driven nearby it and it wasn't so astonishing'' tells Falomi. Here comes the idea: the wing-mirror, almost magically, becomes the slow-motion, a break in the frenetic traffic we live every day. 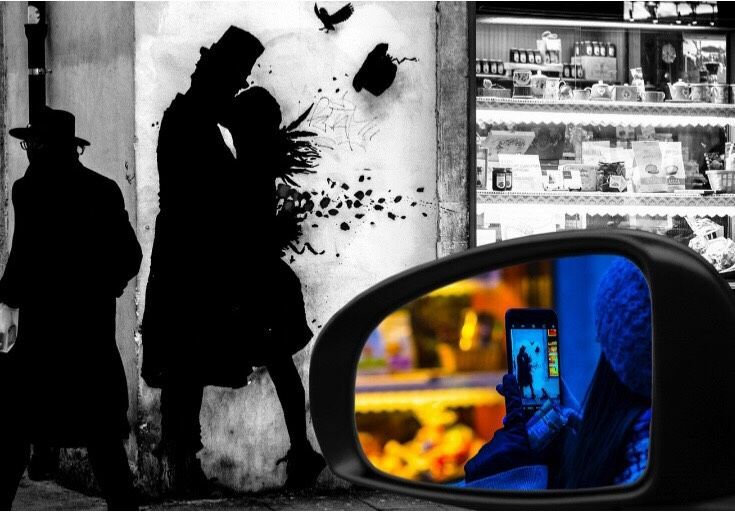 Wing-mirror is like a screen, a container for short-term memory, whom frenzy makes us lose.